Rasmussen has released the results of its tracking polls taken Aug. 1-26. 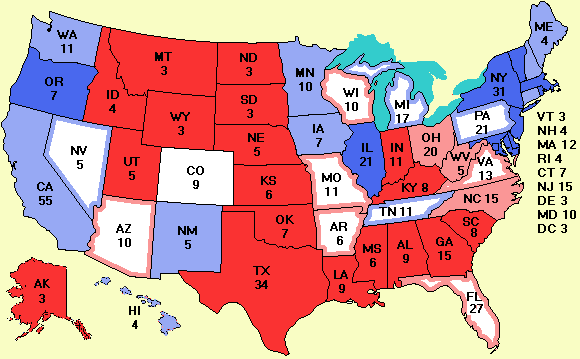 For every state, a poll with a more recent midpoint is available, so these are presented for information only and will not go into the spreadsheet. However, in California, Rasmussen has a poll taken Aug. 16-26, which makes it more recent than the strange Survey USA poll ending Aug. 18, so Kerry's lead in California is now 9%, with Kerry at 51% and Bush at 42%. It is closer than it was though. The New York Times has an editorial today calling for the electoral college to be abolished. The editors want a direct election of the President. Sounds good to me. The electoral college belongs in the Smithsonian Institution, perhaps next to its exhibit on ancient voting machines. Good news on the voting front: A Florida judge has ruled that Florida law requires a manual recount under certain circumstances. The touch-screen voting machines currently in use in Florida do not have this capability and thus violate the law. The Florida secretary of state, Glenda Hood, is fighting this ruling. If it is upheld on appeal, the voting procedure will have to be changed in a number of counties. Could this be the first of many Supreme Court cases this year? Bad news on the voting front: The Missouri secretary of state, has decided to allow Missouri soliders in Iraq to vote by e-mail. The National Committee for Voting Integrity has condemned this decision as too sensitive to fraud. Also, the secrecy of the vote has been called into question. If a solider knows that his commanding officer might see how he voted, that might influence who he votes for. And what would Sunday be without a new cartoon of the week?